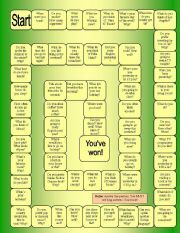 Board Game with 65 questions for speaking practice. It´s based on the New English File Elementary book (A2 Level). I used it for a final review. Template by PhilipR. I hope it´s useful. Song ws. Key included. It has three activities. The first, a pre-listening; the second and third, while-listening. Template by mena22 from http://www.eslprintables.com/printable.asp?id=372673#thetop Thanks to Mena for her generosity. Picture from http://arttoons.blogspot.com/2010/07/slash-e-axl-rose.html Hope you like it! 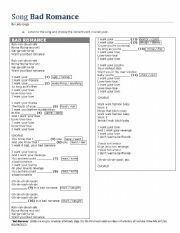 It is a song worksheet with a reading text which I used to contextualize the meaning of the song. This song is really popular in Mexico and my students asked for it. Text taken and adapted from: http://www.songfacts.com/detail.php?id=22941. Templates by mena22 and philipr. Hope you like it. This is a speaking activity. Students complete their tables by interviewing three classmates and writing their answers. They need to complete the last question with their own ideas. 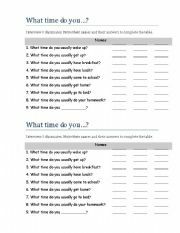 Use this activity after teaching how to tell the time and daily routines. I hope you find it useful. There´s a great picture for this song on this website: http://www.nonprints.com/painting/Strangers_In_The_Night_5858.html Hope you like it! Really popular song (third most watched video on YouTube with more than 445,000,000 views). 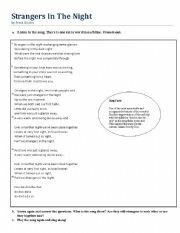 Besides the song is in the present simple, so it is great for elementary students. Key is included. I hope your pupils like it. 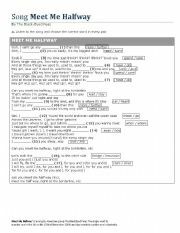 This is an pairwork activity for speaking practice. I use this after teaching vocabulary related to food. 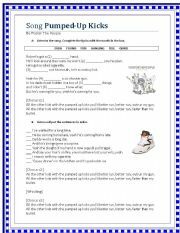 Students interview each other and write down their partner´s answers on their sheets. Students need to complete the last question with their own ideas. I encourage students to use long answers instead of isolated words when they are speaking. For A1 students. 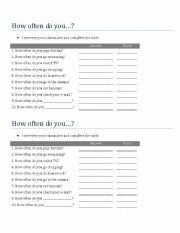 Use the first 8 slides to teach two different ways of telling the time. Then elicit the time with the other slides. 33 words about food and drinks based on the book American English File 1. I took the pictures from free clip art websites mainly from Office. 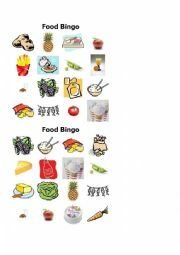 I use this presentation along with the 25 food and drinks bingo cards which you can find in my contributions page. I hope you find it useful. After editing the game, it was showing all the questions at the same time, so I´m have to make it again. Sorry but I don´t know how to delete the bad games. 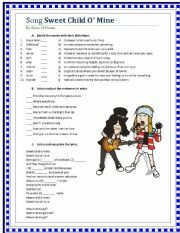 The purpose of this game is to do a review of lessons 2A-2C of the book American English File 1.